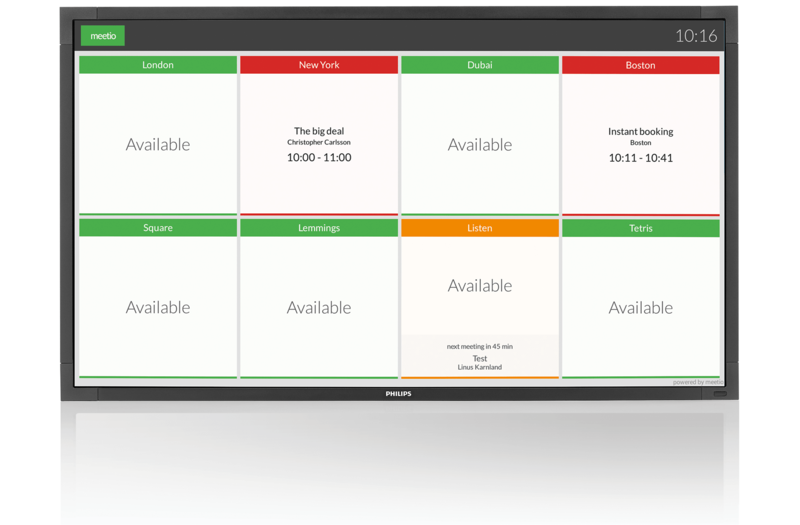 All your office spaces united on one screen. Need to find a meeting room asap? 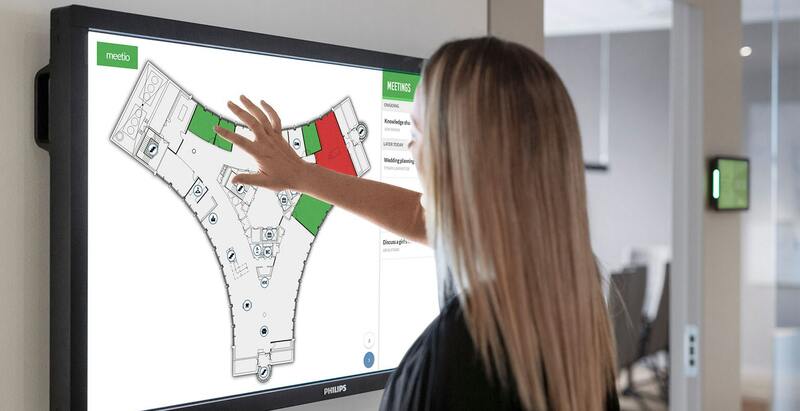 The intuitive floor plan maps give an instant overview of the entire office and the room availability – all on one single touchscreen. 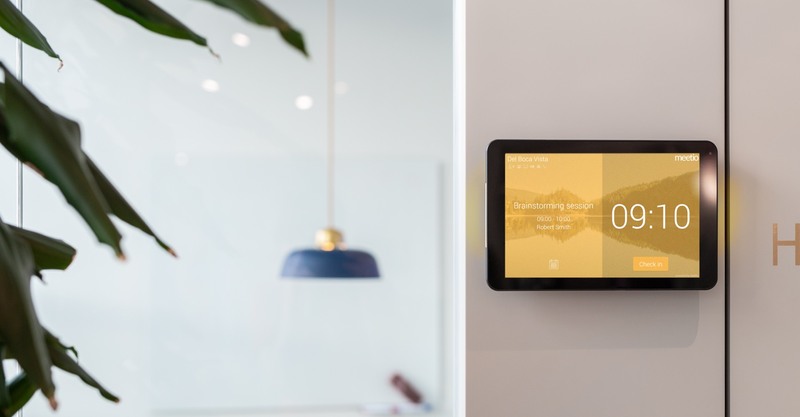 Don't let confusion be your visitors' first impression of you – make them feel welcome by showing them which room that's booked for their meeting and when the meeting starts. Meetio View is ideal in your reception or lobby. When you have found the perfect room for your meeting – book it right away, on the screen. Just click on it and it's yours. Easy as pie. Clearly showcase your workplace in a variety of ways. The map view gives an unbeatable overview of the entire office. 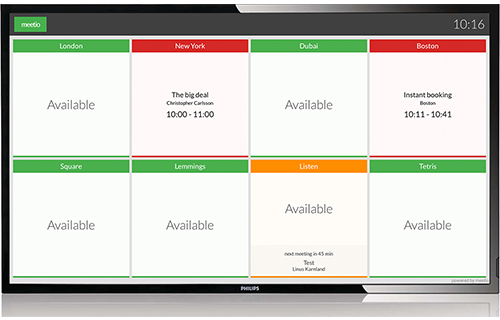 Instantly see where the closest available meeting room is – or find an already booked room. See points of interest such as kitchen, toilets, elevators and emergency exits. Filter rooms by resources, size etc. 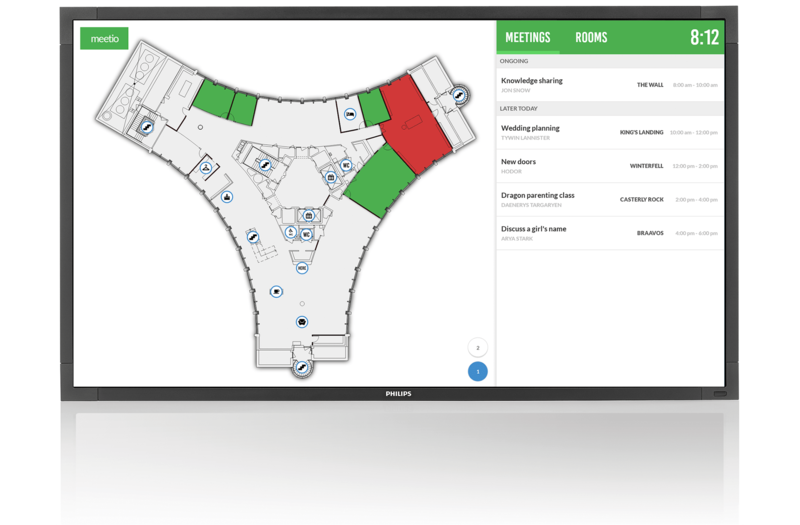 The grid view provides instant overview of available and occupied meeting rooms in your office. Simply click on a green room and book it! Get additional info about ongoing and upcoming meetings, so you'll never risk 'stealing' a room from a colleague. 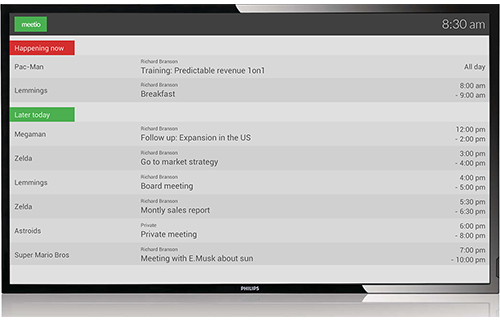 The agenda view gives a crystal clear overview of ongoing and upcoming meetings throughout the day – ideal for receptions and lobbies. Easily see who has booked a room and for how long the meeting runs. Find and book a suitable room for your meeting by filtering on room equipment or number of participants. 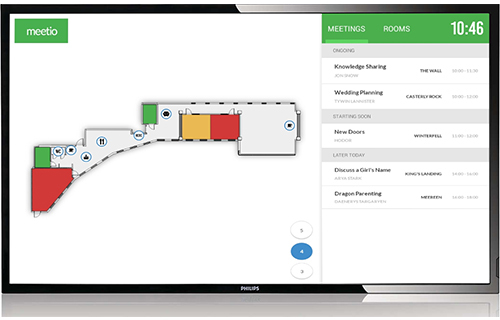 Set Meetio View to only present occupied or available rooms, or mix them to show an overview of all rooms. Add any spaces or tools, like desks, shared cars or other shared resources – the only limit is your imagination, ish. Meetio View seamlessly connects to the most common systems like Office 365, Exchange and G Suite. Central management of all of your Meetio devices in our cloud based web app Meetio Admin. Meetio never requires any extra software or servers to run. 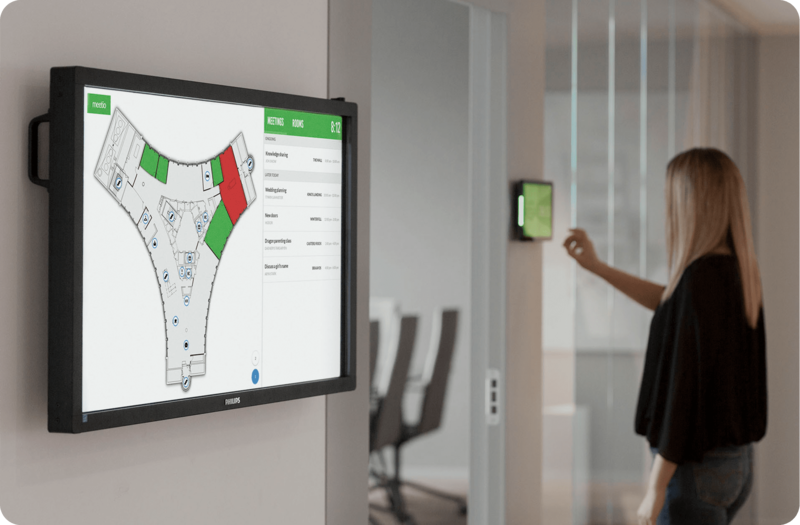 Our software connects to your existing systems directly, reducing complexity and cost. Want to welcome your visitors? Want to show which floor the screen corresponds to? Enter a custom message at the top of the screen. Add your company logo to remind people of where they are and to promote your brand. Simple, yet effective. Show or hide the meeting title and organizer of the meeting. Separate settings to show or hide if the meeting is private. Included in your Meetio package is much more than just a great display with amazing software. World class administration of your entire Meetio suite. Centralized remote management of everything from device settings to updates and calendar integrations. Statistics of workplace utilization gives you invaluable insights into how your resources are actually used. No more guesswork! 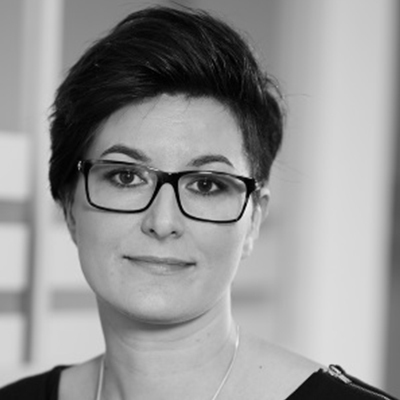 Our support team has an average rating of 4.7 out of 5 from our customers – well, if that ain't awesome... Customer first, always. Enterprise grade security keeps your data as it should be - safe and secure. Meetio View connects to the most widespread calendar systems in the world. You won't have to learn yet another software. Get in touch with us for a complete range of touch screen devices. Run Meetio View on your own device. Plug & play with everything you need. Are you the tech-savvy kind of person? Like to try things on your own? Got an Android device running 4.4 or higher? Try Meetio View for free!